Hillary Clinton is right that cashing in on speaking fees is nothing new. But neither is public criticism of it. Elections may come and go, but the paid speeches will always be with us, as we were reminded during Clinton’s appearance at the Code Conference yesterday. The Q&A session is part of a series of public appearances Clinton has made since Trump’s inauguration for the dual purposes of keeping her brand alive and exonerating herself of responsibility for her disastrous campaign and loss. 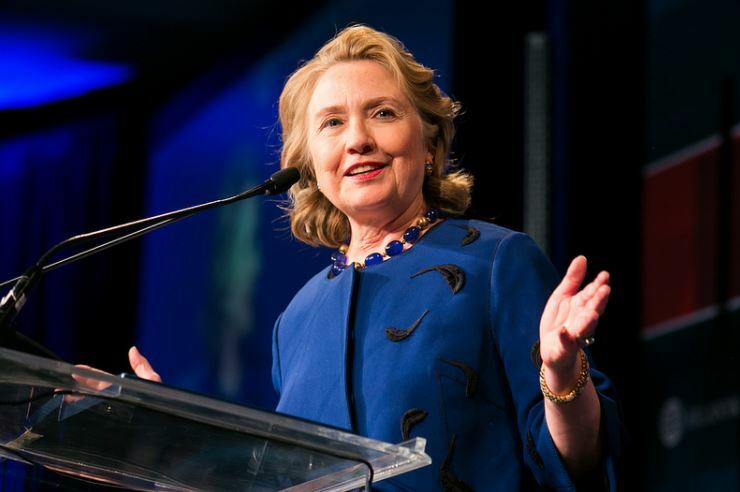 But in last night’s talk, discussion turned to Clinton’s decision to give exorbitantly priced speeches for various Wall Street firms, including Goldman Sachs, which became a major issue during the Democratic campaign. Yesterday at Code, Clinton trialled a brand new defense against critics of her speaking fees: they’re sexist. Clinton is correct that male policymakers have also hawked themselves on the public speaking circuit for eye-popping sums. But the idea that there was a sexist double standard at play when Clinton was criticized for doing the same is clearly absurd. The men Clinton is referring to also received vociferous criticism for their cashing in after leaving office. Clinton should know this because one of those men is her husband. While Bill Clinton was hardly the first world leader to make money off the lecture circuit once he was out of office, he made the practice truly his own, making a then-unheard-of $9.2 million from speeches in his first year away from the presidency alone. His spokeswoman declared him “the most sought-after speaker in the history of the lecture circuit” and said the head of his agency “has been doing this for thirty years, and he’s never seen anything like” the clamor for the former president to speak. Just as questions were raised during the Democratic primary over the potential conflict of interest posed by Hillary Clinton’s hefty speaking fees from Goldman Sachs (an “artful smear” in her view), so her husband’s speeches were shadowed by accusations of impropriety at the time. Clinton at the time was dogged by controversy over his eleventh-hour pardon of billionaire fugitive Marc Rich, which the New York Times called a “shocking abuse of presidential power.” UBS Warburg of London backed out of paying Clinton for a speech in February 2000, concerned about the appearance of a quid pro quo since one of its senior executives had written Clinton urging him to pardon Rich. Similarly, at a speech for software company Oracle, Clinton was asked if the fee was payback for his administration’s antitrust lawsuit against its rival Microsoft. One Wall Street executive labelled it a “thank you for Microsoft speech.” He later also earned some headlines for a speech he gave at an event for Accoona, a new search engine, which came very close to making him the first former president to ever promote a product. Bill continued to receive criticism for his speech-making well into Hillary’s campaign. The LA Times reported in July 2016 that Bill shocked event organizers at the University of California-Davis when his agency demanded double the money as every other former president, as well as a private jet to fly him seventy miles from San Francisco. He also received scrutiny for speaking fees from the Democratic Republic of the Congo, a cricket charity, and many others. Another man who caused controversy through his public speaking engagements was the Clintons’ close friend and political ally Tony Blair, the former British prime minister. Blair followed Clinton into the world of public speaking after leaving office in 2007 and quickly surpassed him, at one point becoming the world’s highest-paid public speaker. His fees received relentless press coverage. Just as Clinton tried to squeeze out as much money as possible for his speeches from even nonprofits and universities, Blair was also uncompromising, at one point pulling out of speaking at the World Hunger Forum because the event organizers couldn’t meet his fee of £330,000 (around $420,000), something he was widely pilloried over. It was also widely reported that Bush charged a veterans’ charity six figures to speak at one of its fundraisers, with one Iraq War vet telling the press that “it’s kind of a slap in the face.” He was also criticized for charging $100,000 to speak at a homeless shelter fundraiser. It’s not always heads of government. Former treasury secretary Tim Geithner received plenty of press attention when he started earning six figures per speech from the same financial sector that viewed him as their “man in Washington.” When he first ran for president in 2007, Rudy Giuliani’s paid speaking career received scrutiny, with the Smoking Gun calling him “high-rolling” and “diva-like,” and it received further scrutiny when he was in the running for secretary of state last year. Across the pond, former British prime minister David Cameron’s £120,000-a-pop speaking fees have racked up their share of headlines, as have those of former chancellor George Osborne, former prime minister Gordon Brown, and former leader of the Liberal Democrats, Nick Clegg. In fact, men were receiving criticism for such speeches long before Clinton was even in the White House. In 1989, Reagan entered what the Washington Post called a “swirling controversy” over the $2 million he was paid for giving two twenty-minute speeches paid for by the Fujinsankei conglomerate in Japan. And before Reagan, there was Gerald Ford, who his own biographer says “created the commercialized former presidency,” albeit by leveraging his connections and his stature as a former president for business opportunities rather than through speaking fees. Clinton’s claim is particularly absurd given that it was barely more than a month ago that Barack Obama — who, we might recall, is also a man — received a torrent of criticism for pocketing $400,000 for a speech from a Wall Street firm, the same industry Obama allowed to get away with various crimes scot-free. (Similar to Clinton now, some tried to claim criticism of Obama for this was racist). Sexism is unfortunately alive and well, and continues to represent an ugly, often invisible barrier for all women to varying degrees, including Hillary Clinton, who has faced decades of hideous sexist attacks alongside legitimate critiques of her record. But to use sexism to wave away legitimate criticisms of Clinton’s lucrative career of public speaking is a cynical abuse of the term — not to mention one that is starkly at odds with the facts, given the long history of criticisms of male policymakers cashing in. The only double standard here is that criticisms of taking huge sums of money from the financial industry and other corporate interests only became an “artful smear” and “McCarthyite” when applied to a Democrat in an election year. When it comes to speaking fees, greed is gender-neutral.